THE ARCTIC is the smallest and shallowest of the Earth’s five oceans, occupying 4 percent of the world’s ocean space and surrounding the North Pole, the northernmost locale on the planet. The waters of the Arctic are fairly equidistant around the area, making the North Pole the approximate center of the ocean. 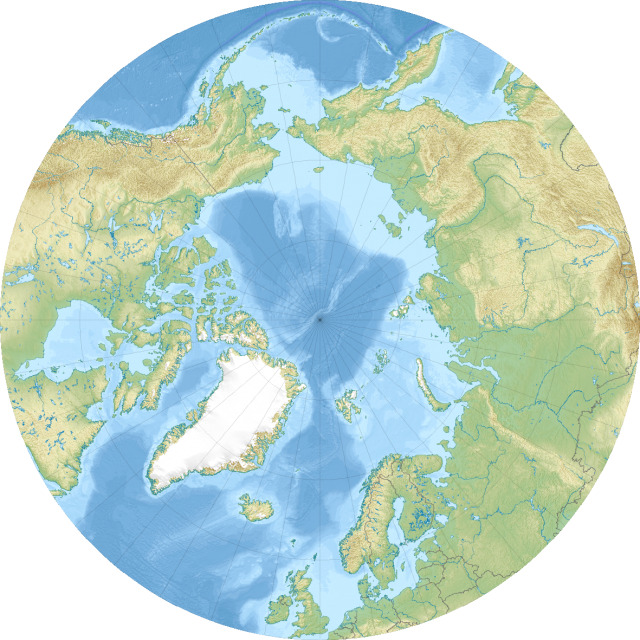 The majority of the Arctic Ocean is found north of the ARCTIC CIRCLE, which is one of the five circles of latitude marked on maps. Everything north of this line is considered the Arctic region; this area is mostly water, but the northernmost parts of ALASKA, CANADA, RUSSIA, NORWAY, and a significant portion of GREENLAND are within its borders. Therefore, most—but not all—of the Arctic Circle is ocean; and most—but not all—of the Arctic Ocean is north of the Arctic Circle. Greek explorers of the late 300s B.C.E. discovered this ocean, with Pytheas reporting frozen waters located six days north of Britain. Ancient Greeks named these waters after the Arktos constellation found in extreme northern skies, a cluster of stars now known as Ursa Major or Great Bear. The average depth is 3,407 ft (1,038 m) and its deepest point north of Svalbard, Norway, is 17,881 ft (5,450 m). Although some of the ocean is not deep at all, the lowest point, Fram Basin, is -15,305 (-4,665 m) below sea level. The lowest surface temperatures of the Arctic Ocean occur in February at -28 degrees F (-33 degrees C) and the highest in July at 29 degrees F (-2 degrees C); frozen precipitation averages 10 in (25 cm) annually and rarely melts. Because of constant cold, the central surface of the Arctic Ocean is covered with ice 10 ft (3 m) thick, and some ice can triple that thickness. During summer months, free-flowing water surrounds the ice; during the winter, ice thickness doubles and even extends to land adjacent to the ocean. Around June 22, the sun can still be seen on the horizon at midnight. This gives the region its nickname: Land of the Midnight Sun. The Arctic connects with the ATLANTIC OCEAN by Greenland, and the Bering Strait merges the Arctic with the Pacific. The PACIFIC OCEAN is more than 13 times the size of the Arctic, but even the world’s smallest ocean is 5,440,000 square mi (14 million square km), with a coastline of 28,203 mi (45,389 km), making the Arctic nearly 1.5 times the size of the UNITED STATES. Two significant waterways also connect to the ocean: the Northwest Passage, which flows into the United States and Canada; and the Northern Sea Route, which provides water to Norway and Russia. The Arctic contains five continental shelves, which are areas of shallow, submerged land located along the edge of a coastline. When a continental shelf ends, there is generally a steep slope that descends into the largest portion of the ocean floor. One of these, the 900-mi (1,448-km) Siberian Shelf, is the largest continental shelf in the world; approximately 50 percent of the Arctic Ocean’s floor consists of this geological feature. An underwater ocean ridge divides the Arctic into two basins. Much of this ocean contains icebergs, frozen waters broken off from glaciers formed on the land. Some, especially those that form on Ellesmere Island and then break off (calve) into the Chukchi Sea, are large enough to be considered ice islands and last for several years. Once the icebergs hit the relatively warmer waters of the northern Atlantic, however, they melt fairly quickly. Few icebergs hit the Pacific, blocked from proceeding by the Bering Strait. Fish, seals, walruses, and whales reside in these waters, and petroleum and natural gas is pumped out. The Arctic is also home to the only ocean bear on the planet. Because of the extreme cold and low sunlight in this region, this ocean is slow to adapt to or recover from environmental change; scientists are watching the thinning of its polar ice and debating the connection between global warming and the shrinkage. This region also provides scientists with information about pollution. Since it generates little of its own contaminants, the increase of pollutants found in the area help measure the world’s increasing water and airborne toxicity.